Navigation: Home » Personal Finance » Is Dave Ramsey’s Investment Advice Misguided? Dave Ramsey is a controversial figure in the Finance realm, at least in blogs (and blog comments), discussion boards, and other mediums where personal financial mathematics are discussed. However, Dave Ramsey’s investment advice doesn’t usually cause the controversy – most of the push-back comes from his advocacy of a psychological debt payoff method known as the “Debt Snowball”. The Debt Snowball is a form of debt pay-down where you pay off your debts in the order of the lowest account balances regardless of APR (a method which is shown to be mathematically inferior to “highest effective interest rate first”. Psychologically? For many people it works.). Mr. Ramsey is one of the most famous Personal Finance authors in the field today, and an esteemed TV guest and radio star to boot. According to Wikipedia, he once filed for bankruptcy due to financial issues in the 1980s, and according to the Tennessee Department of Commerce and Insurance he held an insurance sales license from 1984 to 1996. His Personal Finance empire is the outcropping of financial counseling he started for couples at his church. He started to attend seminars and eventually developed his own style and methods… which rounded into the Dave Ramsey cult of personality that exists today. Bestselling author, radio host, TV personality, Christian? You better believe that a lot of people have an opinion about him. Most people took exception to Dave’s return figure – the 12% number (here’s one angry reaction from Mandi Woodruff at Business Insider). Now, the S&P 500 may often return more than 12%, but everyone reading this obviously still remembers the issues with the stock market during the Great Recession. Remember that huge drop? So, was 12% too optimistic? Lucky for you, this was a question we were born to answer! Last year we developed a tool to let you figure out the returns of the S&P 500 over any time period using data provided by Robert Shiller on his website. Now, that tool is great – but we have better ways to play with that data (namely, by tossing it into a spreadsheet program and crunching some numbers for you!). Let’s evaluate Mr. Ramsey’s comment with the S&P 500 in mind… the most popular benchmark in the United States, which also happens to have tons of index funds and mutual funds and other ways to invest in it. It’s fair to say that most people have access to an S&P 500 index fund or some other means to invest in the index’s components. Editor: We’ve since also put our S&P 500 trailing returns calculations into a tool you can use. Now, assuming that most people are talking about the S&P 500 when they talk about the market, it’s just as rare to have 12% trailing returns as returns less than 6%. Misguided Complaints about Mr. Ramsey? Okay, so 12% returns are a little too ambitious. 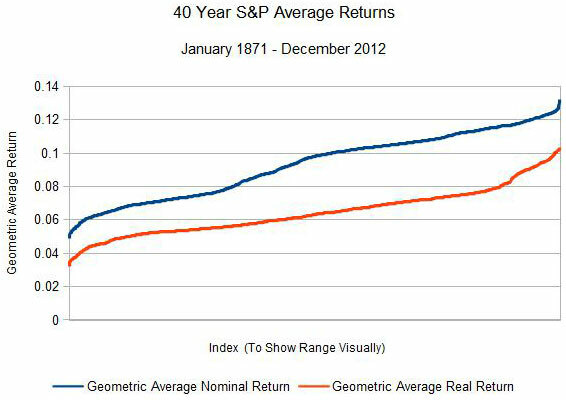 If you retired in December 0f 2012 after 40 years in the markets (defined as the S&P 500, of course) you would have experienced geometric averages of 9.68% nominal and 5.16% real returns. And, what if you invested $100 a month starting in December 1973 (and reinvested dividends) in a magical fund with no transaction fees and no taxes that tracked the S&P 500 index perfectly (don’t look for that fund – it doesn’t exist)? I did the math for you – you’d have $636,758.95. It begs the question, however – why would we get mad at Dave’s tweet encouraging financial discipline? It seems that, perhaps, you shot for the stars and ended up on the moon. Isn’t that better than earth? (And before you ask – goal seek already calculated that to get to $1,000,000 with that fantasy fund you would have needed to invest $157.05 a month). Okay, not about the 12% thing – that’s too high for you to set your expectations. However, “Everyone should retire a millionaire!” rings completely true. If you aren’t investing now, get on it. I don’t care how you do it – a giant lump sum, periodic monthly investments – just put your money to work for you. Even if you don’t make 12% over a career, you’ll still have a lot more money than if you try to start a flame war with Dave (or OVER Dave, if you find the right fans) on Twitter. That’s valuable time you can use for more seed money in your investments! I think 12% is a total stretch – but I work the opposite end of the spectrum for my retirement and assume AAR of 4% – 6% in equities. I compliment poor returns with increased savings. Dave Ramsey was not wrong about the math, but you know what, even using a realistic number like 8% still gives a solid return over time! If I spent 40 years saving $100 a month and ended up with $650,000… I might be mad for a few minutes, but then I’d recognize that, hey, that’s not so bad. 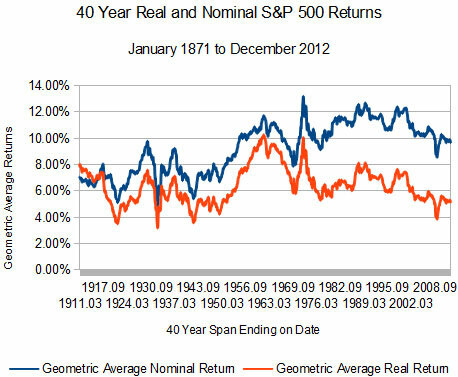 I did the math for you – 100% of 40 year trailing periods returns 4% nominal, and 97.79% did it for real returns. Hopefully, that means you’re safe (but history is no guarantee of future returns, blah blah). I think Dave Ramsey’s message may have been lost in the unrealistic expectation of a 12% return. The message is the same that I try to drive in my young adult children. Save often and start young. That way,when you’re my age, you won’t be stuck in a job that you “Have” to have, you can work at a job that you “Want” to have. Yea, like my comment to Robert – you might have been mad if you started back in 1972 and ended up with $650,000 – but you’re still way ahead of the game. Save early and often and all that jazz… it works, even if not at 12%. The worst of his tweet is that it gives false hope and encourages extremely low savings standards a 40 year period. $100 will make you a millionaire? That’s just a little dubious. He got me into personal finance. And I had a delusion for years that you could milk the S&P500 for 12% annually, and while it has done pretty well the past few years, I think a more realistic expectation for growth over time is 7%. There’s no math behind that estimation whatsoever, it’s just not as lofty as anything in the double digits. I did the math for you with the theoretical no-tax no-transaction-fee S&P fund – 83.5% of the periods had nominal trailing returns over 7%, and 33.0% had real returns over 7%. Johnny, did Ramsey make you believe you could get 12% annually? If so, for how long? I want to live in a world with 12% annual stock market returns with 2-3% inflation. Life would be good. Last time you say 12%+ nominal with 9%+ real? If you started investing in 1933 and retired in March, 1973. 12.44% nominal returns and 9.02% real returns (sorry, inflation ate a bit, but I assume that’s acceptable?). The only thing I’d take offense to, is that he’s tweeting these facts about saving $100 per month and being able to retire a millionaire at 12% returns. It’s just plain unrealistic and false to say this to people who really need the help. I would have been happier with: “starting to save with even just $100 a month will get you ______ at the age of 65”. But don’t start tacking on millionaire statuses on savings that won’t get you there. By my calculations, people need to save at least $10K a year for about 40 years to secure (real not nominal) millionaire-ship or $833.month, but that’s unrealistic for a lot of lower-income families. What return are you using? (I know, I know, go ahead and accuse me of being lazy and throwing it in Excel). The last 40 year real return on my chart is 5.16%, so I assume you’re a bit closer to accurate than that tweet. I use 5%. I never like to go above it, because you just never know. Ramsey has definitely helped a lot of folks, but sometimes…. he goes a bit far. I know we can’t say certain things to discourage others to just start trying, but it doesn’t help to give them false hope. 4.88% minimum nominal, 3.17% minimum real – why not 3.17%? Haha, I wouldn’t either. I think modeling based on 4-6% is certainly justifiable. I think the problem here is that with too high of expectations it actually gives people justification to save less. Say I’m figuring out how much to put in my 401k. I do a little math, plug in Ramsey’s 12% annual returns and it gives me a number. I then save that much each year thinking this will be enough. But then the market doesn’ hit 12% returns and I end up retiring short of my needs. You can easily have pepole look at that quote and then decide that saving $100 a month is enough since it will make them millionaires, but saving that little is actually going to result in pretty meager retirement savings in the end. Ramsey’s message might help someone who’s saving $0. But its not likely to help anyone saving $100 or more and in fact will likely give them unrealistic expectations and could end up backfiring and hurting their retirement planning & savings. Yeah, you’re right. I can imagine a scenario where someone saves $100 a month and doesn’t adjust for inflation, then comes up short on their retirement plans. I am sympathetic – there is only so much you can convey in a tweet, but I wouldn’t have lead with 12% – that’s unnecessarily optimistic, and the last time the S&P saw 12% trailing returns was December 2000. Plenty of time to change the applause line. I’d imagine people get mad at Ramsey for this kind of thing more because he’s supposed to be an expert and he’s giving advice that is misinformed. Ramsey should know better and he’s misinforming millions of people who trust him. Thats why I think people get mad. Jose’s comment below is right. It is sad that Dave Ramsey’s real message in the Tweet was lost with everyone focusing in on an unrealistic expectation of a 12% return. The true message is that everyone should be saving, save often, and save early. His comment goes to show that we often make excuses that we do not have extra money at the end of the month to start saving. But, if we truly look at our budgets and priorities, then we can find the means to save early and save often to reach $1 million and more. In the interest of deflecting the haters/doubters/non-savers, he should revise his numbers a bit. I don’t think $1,000,000 at 9.68% nominal returns for $157.05 a month is succinct enough, but the numbers need some massaging. I do not believe there is a problem with Dave Ramsey I believe there is a problem with people’s reality. First off I believe Dave Ramsey provides a great service to the personal finance community, he has taken a topic that corporate professionals have made so complex and simplified it for the average person. With that said, I personally cannot stand Dave Ramsey’s “investment” advice. As I stated before he’s fantastic when it comes to personal finance but horrible when it comes to investing. He recommends dollar cost averaging in low fee mutual funds, yada yada yada, now that is fine and dandy for joe blow who wants to have somewhat of a decent retirement but for someone who wants to become truly rich?! Nope, mutual funds won’t cut it. I’ve listened to his podcast thousands of times and heard him slam options or other in depth investment strategies. Bottom line, Dave needs to stick to what he knows best! Unless this site has quite a growth spurt and people take my messages to heart, Dave Ramsey will have done way more for people and their finances than Don’t Quit Your Day Job. I admire the job he’s done, and the results speak for themselves. Still, financial sophisticates should pay attention – once friends and family are on the right path, we can do a lot of good by helping them with more complicated topics like asset allocation. I think I touched a nerve on this one. I agree with the sentiment, though – 12% is a long way from 9%, and people should make more conservative estimates when figuring out something as important as retirement. The difference is $500,000 before fees, haha. My favorite is that if everyone were to save more to invest, total stock market returns would decline, not go up. Either way, I understand his point, but I really wish he’d get off the 12% number because the people who follow and spread his message rarely fact check for accuracy. Right – and I’m just insane enough to run the numbers. Revise the numbers, put out the new message (9.5% nominal? 9%? $200 a month?) and get on with it. Even $100 a month is awesome, from the perspective of someone who doesn’t save. lol exactly. Asset demand theory FTW. That’s my #1 reservation about using indexing as a singular investing strategy. As for Dave Ramsey: as soon as somebody reads his infantilizing “baby step” that instructs them to pay off the lowest balances first rather than highest interest, they should realize he’s not right about everything. He rips on the banks, credit card companies, etc. and then encourages debtors to give them free money. The real controversy is the ELP (Endorsed Local Provider) network where he sells you to a pack of wolves with 5% loads and high fees. I must say that that is one of the best calculators I’ve played around with – I need to step up my game. Thanks for linking that – I didn’t know how the sales loads worked on the mutual funds. I figured that “13%” wasn’t the whole story when I saw the front-end sales charge of 5.75%. Glad you enjoyed Greaney’s SS. He has really good stuff. Unfortunately, it is only 3 or 4 times a year. Of course, I might need to toss PE/10 in there or people on the internet might get mad. I think people got too caught up on the rate of return… and completely overlooked the lesson behind the message. No matter what your rate of return – if you start saving young, and save a set amount regularly… you’ll do well. He should change his math a little though – $200 a month, 9.5% going forward? Easier to defend than 12%, especially if we haven’t seen that in the S&P 500 for the last 12 years (end of 2000 would have seen it). Neutral on Dave, by the way. Yes, he’s gotten a lot of folks to start thinking the right way about ridding themselves of consumer debt. Yes, he’s a douche for steering them towards mutual funds, and wearing a false expert hat. Yeah, I don’t know how to approach the math behind the Debt Snowball. “If you were good at math you wouldn’t be in debt”. Good point, Dave. The mutual funds though? C’mon. Vanguard, Fidelity, T. Rowe Price? There’s no need to pay absurd loads to invest in stocks. I just wrote a piece on this very issue. Spot on with everything. Biblically, it is more appropriate to think in terms of 8%. Just ask an FA for a hypo for American Funds ICA (AIVSX) showing 40 year rolling returns, and see for yourself what Ramsey is talking about. As for this particular fund, he is correct. As for the market? That is a different story.